Moreover, Tim really understands that one has to tell a consistent culinary story – he thinks first before just opening a restaurant. This brings me to my second aspect of admiration: he is definitely the only German chef being able to successfully build a personal brand and leverage it in terms of opening new satellite restaurants each of which with its very own identity: Sra Bua by Time Raue in the former MA complex, La Soupe Populaire, Studio Tim Raue and lately the new Colette bistros in Berlin, Munich and Konstanz. This is only possible if someone is a superior team builder who implants his own spirit and vision within the team. Tim is clearly the one of the only chefs to have the vision to do so and thus could successfully transfer his personal brand across the whole TR family. 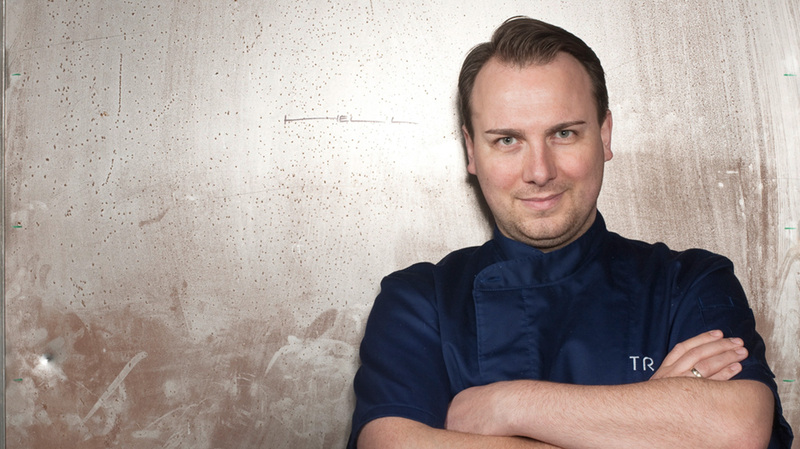 But at the heart of this ’empire’ is his Kreuzberg Restaurant Time Raue, now at 2 stars in the Michelin and a splendid No. 52 rank in the Worlds 50 Best restaurant list this year. 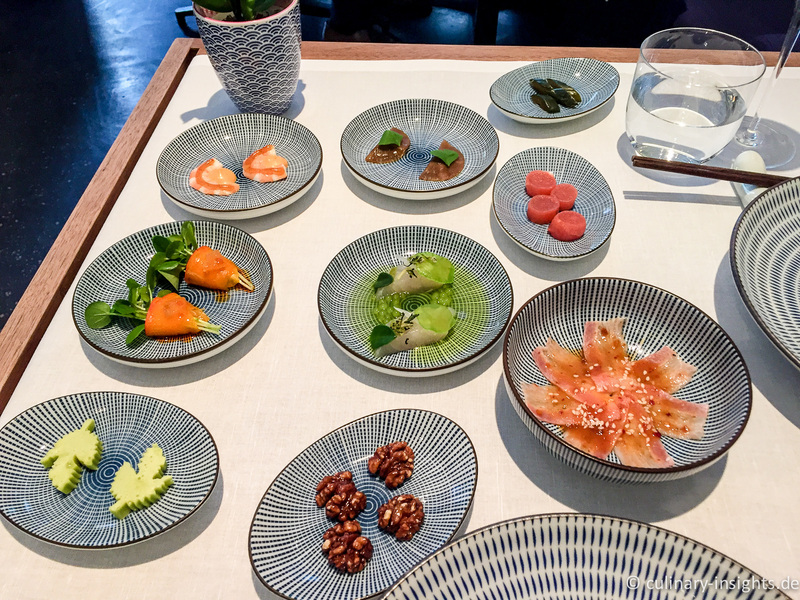 Whereas the menu concept originally focused on two menus with up to 6 courses, one now can enjoy an eight-course menu ‘unique’ and a signature menu with 4 or 6 courses as well a vegetarian option (4 or 6 courses). For lunch, there is nice selection of up to 6 courses (for a steal of 78 Euros!) including a nice selection of his infamous Dim Sums. He went for lunch and let him cook for us. No bread. No rice, potatoes are other carb side dishes. Raue wants the diner to fully concentrate on his interplay of pure flavors inherent in his dishes. And there is no parade of amuse but rather a joyful dance of small bites iconic of his cuisine like the fantastic ‘pork belly and sesame’ or the ‘marshmallows of green curry’. Was it spicy? Yes, but deliberately so without overdoing it. Still worked nicely with a glas of Riesling Sekt from Jochen Dreissigacker! Nice start! Our menu started with IMPERIAL CAVIAR sprat | yuzu – a layered masterpiece of sprat meringue and butter cream, imperial caviar, yuzu jelly, lettuce, green chili and sorrel. Taken in one piece (but do not bite) the meringue just melted in the mouth (just for your mouthfeel) and sequentially set free some spiciness and the wonderful dialogue of iodic/acidic caviar and yuzu with some herbal undertones. Perfect! When I ate GOOSE LIVER jiaogulan | nori for the first time last September I thought I had it all when it comes to goose liver – but this one is both different and familiar at the same time. 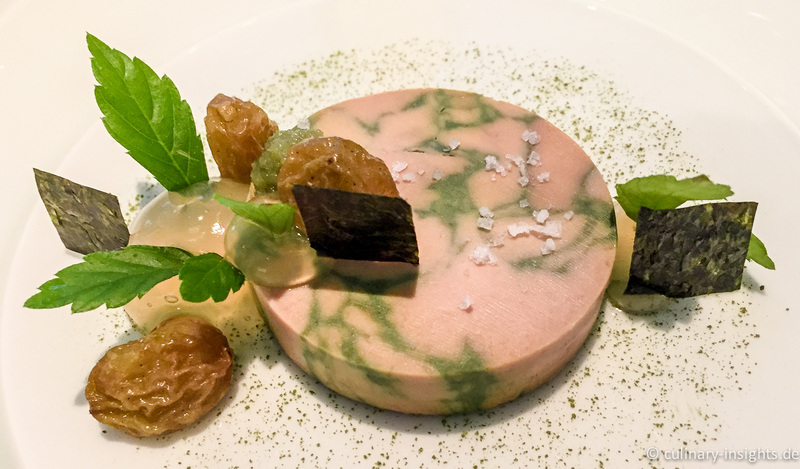 The terrine was carefully flavored with matcha tee powder that in itself added some nice herbal and thein notes and thus made the terrine less fatty. Then, whites grapes (some jelly, marinated as well as dried grapes) kicked in with their delicate acidity and sweet-sour interplay, nori algae added crunch and iodic tones, all kind of building the stage for the fresh wasabi paste and jiaogulan herbs that picked up on the intrinsic sweetness of the terrine. The resulting degustation was simply fantastic, already a signature! FISH MAW elderflower | turbot – hold on, fish maw? In China a great delicacy I must admit I had never eaten anything like it. 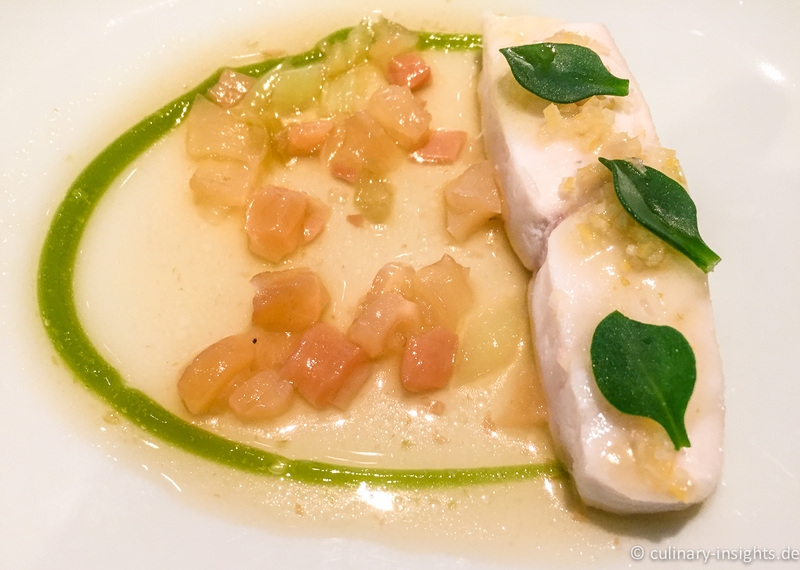 In this dish, despite the perfect turbot, these swim bladder pieces are the star – Tim cooked a sugo of fish maw and elderberry and paired it with green bell pepper cream, lemon zests, colewort and lemon gras (I guess there was also some ginger on top of the turbot). How did it taste then, this fish maw? Being just collagen it works like sponge being quite versatile to actually soak up the flavors that it is cooked with. Surprisingly, apart from the intricate texture the Chinese love it for, it almost tasted a bit beefy with some veal annotations – God knows how Tim had accomplished that. Excellent! BRUSSELS SPROUTS banana | lime is a brand-new dish that just made it to the menu. When serving the dish Tim commented that he hates both brussels sprouts and banana (like me) but that this combination may actually turn the two minus in a big plus. I couldn’t agree more – somehow the dominant sweetness of the banana and the bitterness of the brussels sprouts perfectly balanced out, wonderfully accentuated by some wild peanuts roasted in curry and a slightly lime jus added some quite interesting sweet-sour overlay. Ingenious! SUCKLING PIG dashi | japanese mustard was next – also not expected to be served at this restaurant at all. 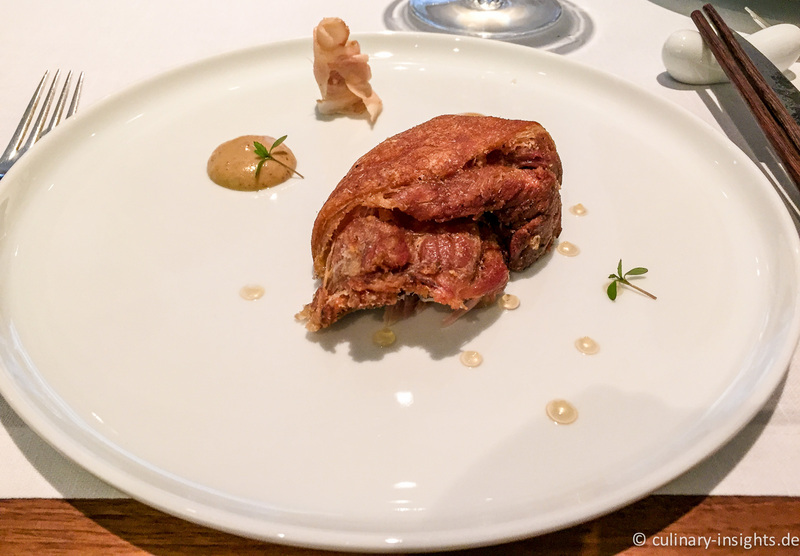 A wonderful take of Eisbein (pickled knuckle of pork) made from suckling pig – simply the best I ever had – very crispy on the outside and perfectly tender and juicy on the inside. Some cream of Japanese mustard, marinated ginger and dash jelly completed this – DIVINE! 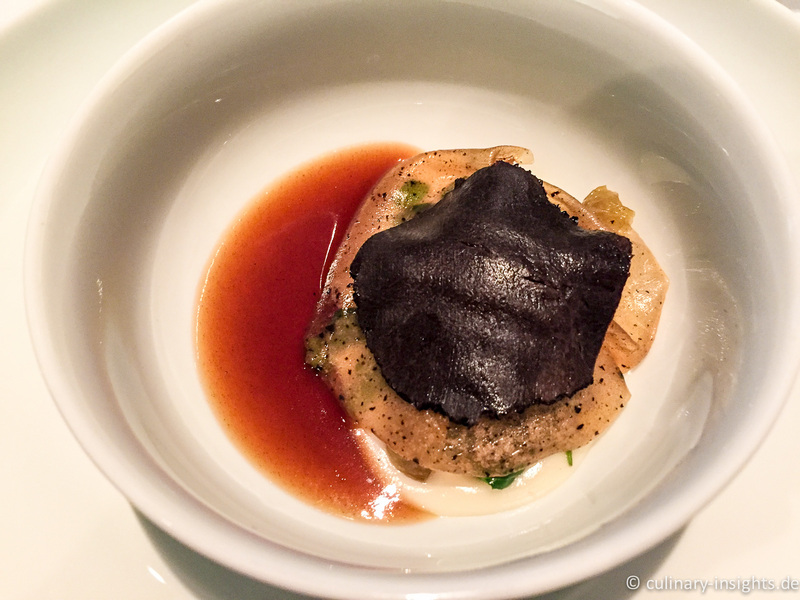 Next up was the main – a modern take on dim sum: BLACK TRUFFLE dim sum rice dough | spinach. Maybe one the weaker dishes of this lunch but maybe it was just difficult after the two stellar dishes before. A quite dense preparation, the singular elements couldn’t fully exploit their potential – there was Jerusalem artichoke puree, dim sum rice dough, sautéed spinach, hazelnut oil, habanero chili jelly, burned bone marrow, rice wine sugo, white grapes and black Australian truffle – a yummy overall dish to actually bath-in, very good but less surprising than the predecessors. Very good. All elements were just perfect, this time I especially fell for the sugo but the whole dish offered so many facets that are interesting and surprising: DIVINE! 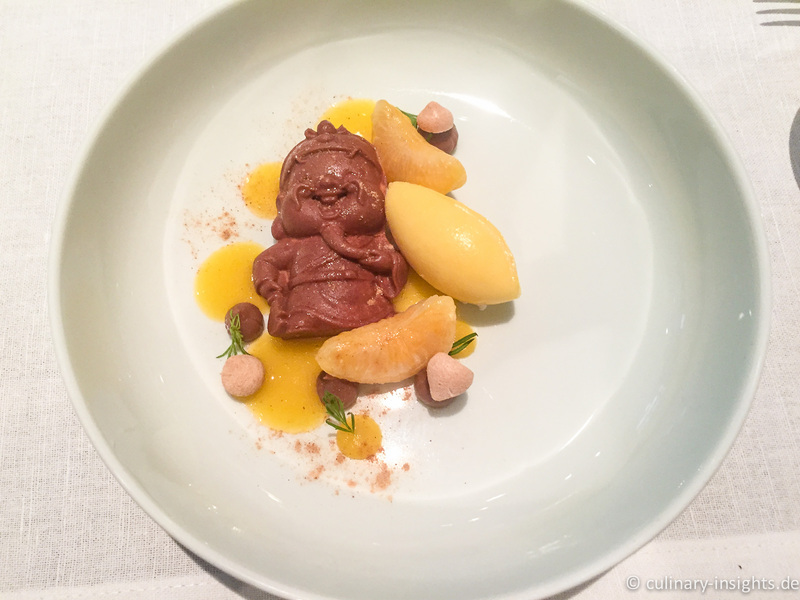 Hard to keep the level, desserts at Tim Raue are always good but never really the highlights – the presentation of GIANDUJA CHOCOLATE mandarin | star anis was funny and playful, although the chocolate seemed to dominate the other more subtle flavors a bit too much. Still very good! 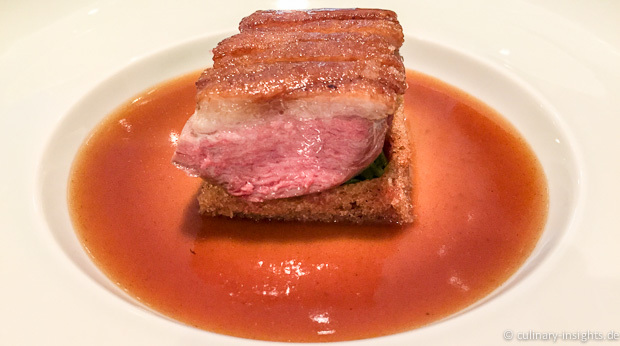 Eating at Time Raue is special and unique – you just eat what Tim himself loves. And exactly that love and passion is transported on every plate, via the modern, casual yet impeccable service and the fitting interior: an overarching care for details, focus on taste with clear attention steps – you just feel comfortable. High-end comfort food? 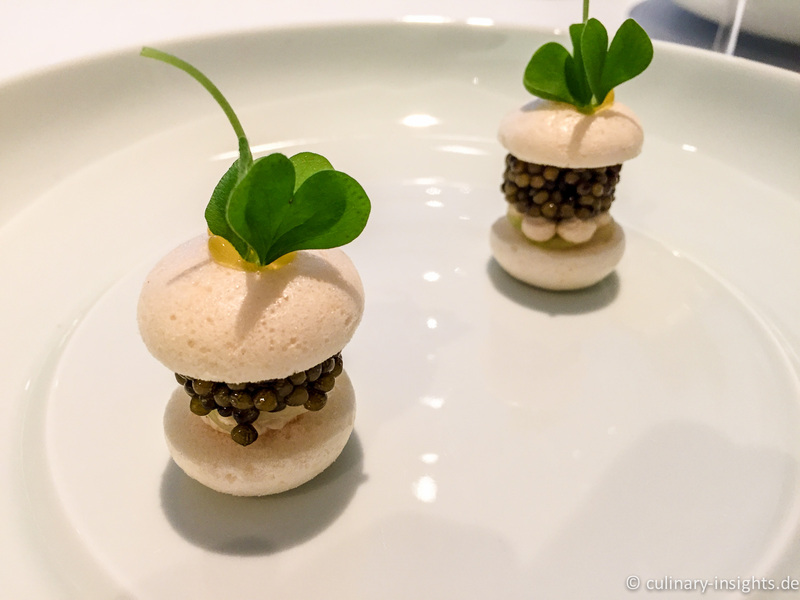 Surely this is how modern high-end gastronomy should be: a casual, relaxed, interesting and yummy experience! What deserves special mention is the wine service of Mâitre / Sommelier André Macionga who serves less than ordinary wines to the surely not easy to be accompanied cuisine – often with some sweetness to counter the spiciness and always a perfect match! Tim Raue, Chapeau! For your cooking, your team and for enriching my culinary universe. One can cook differently but definitely not better! A truly unique experience – THX! 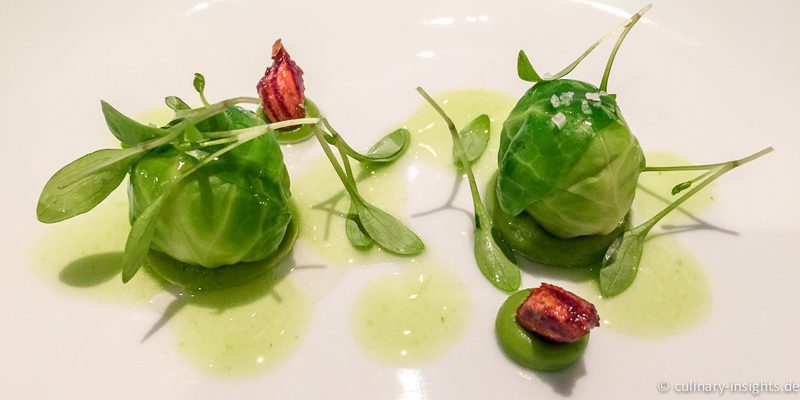 This entry was posted in Europe, Germany - Fine Dining, Tim Raue by IFS. Bookmark the permalink.